​​Steve Widder stands alone as Reilly Cycling's most loyal and cherished friend. Steve has been a guest on our trips since the beginning and quickly became an important part of our family. To say Steve is "good for the soul" is an understatement. He personifies the effervescence of the human spirit, and his love of cycling and the Tour de France are beyond equal. Steve's caring, calming demeanor affects everyone he meets. His child-like exuberance for Alpine cycling and simply the way he infects everyone with his positive attitude make our trips better every year. We cannot imagine a July in France without Steve, and we are so fortunate to have him join us each year and present the Award we named in his honor. 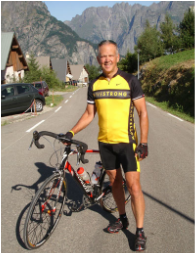 In 2017 Steve Widder rode and successfully completed the Marmotte Cyclosportif. He proved to all of us that you can do more than you think you can! One of the Toughest single day rides in the World was no match for Steve who rode for 17hrs straight to finish on top of Alpe d'Huez at midnight! There were no cheering supporters, no fans to welcome him home and in fact even the finish line had been taken down. None of this mattered to us or to Steve. He finished the race and completed something most people will only dream of!! The Widder Award is a Reilly Cycling Tours tradition given to one recipient at the end of each trip. The award is not earned by the fastest, the strongest, or the most accomplished cyclist. The Widder Award is more often given to the single person who most personifies the spirit of both Steve Widder himself and the essence of Reilly Cycling. We are a small company built on friendship, family, and a common love of cycling. We truly love what we do and the people we meet. The Widder Award recipient each year shares these values and has enriched all our lives merely by their presence. If ever there was a 'feel good' part of our trip, it is the last evening of the trip when this person is named. It's the real stuff in life! Copyright ©2014 Reilly Cycling Tours. All Rights Reserved.